Heinrich was the first character I wrote about. My mind contemplated where to go with him and how to develop his personality. 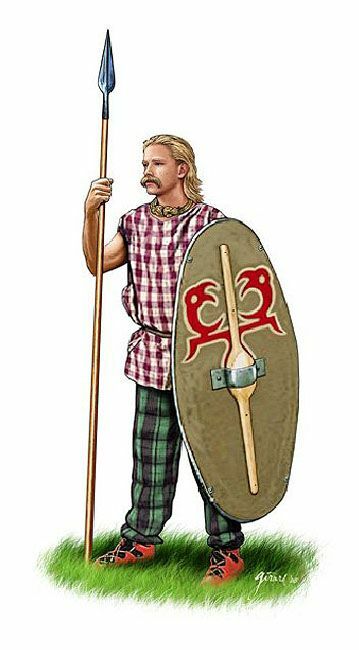 In the end, my Celtic blood won through and I figured that I would have him as the typical Celt; long blond hair, drooping moustache that is a sign of maturity. I knew I wanted him a young inexperienced warrior, maybe some when fighting off riff-raff but never having been part of war or battles where there are numerous dead. I was hoping he would develop throughout the story – how wrong can I be! He’s actually turned out to be one of my least favourite characters, especially in the first half, but he slowly grew on me as he made his way throughout the story. Although I definitely have several characters I prefer to write about (Rondur, Wilhelm and Emile are three of my favourites), Heinrich is becoming a little more interesting. I’ve found you tend to get torn apart when you develop characters in the zombie genre as, well, some will get torn apart. I’m of the Walking Dead/Game of Thrones idea that no one is off limits. It makes it all the more exciting! However, I still can’t always bear it to get the one’s I’m keen on chewed up so I’m pretty sure that if those eventually die it will be for something spectacular. I’ve finished chapter eight’s redraft today and tomorrow I’ll be giving Nicola a call to see if she’s interested in doing the cover. I can’t exactly afford much buy heh ho perhaps she’ll do it for the fun!